EndeF is one of the companies that has been given a boost by the Repsol Foundation Entrepreneurs Fund (Fondo de Emprendedores de la Fundación Repsol). The marketing of an innovative hybrid solar panel is providing employment to ten young people aged 30 to 35. The truth is that most young people look for jobs as employees but it is also true that many try to establish their own companies, either through necessity or conviction. Within this group, some ideas develop into innovative products that improve people’s quality of life and provide added value to society. The business venture of three young people from Aragón belongs to this category. 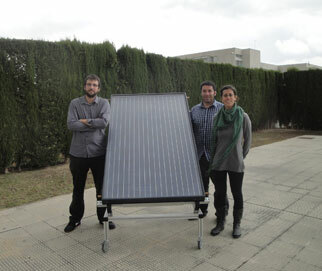 Alejandro del Amo, Isabel Guedea and Gonzalo Brun were working in the research department at the University of Zaragoza and spent their free time developing a hybrid panel that would improve the thermal efficiency of conventional photovoltaic systems, which lose 85% of the solar radiation they receive. Their work began to bear fruit in 2012 when they decided to enter the Solar Decathlon, a competition that brings together the best developments connected with renewable energy. This year, the challenge consisted in generating the maximum amount of power in the smallest possible space. “We had considered three solutions; we tested them and saw that one, the one with the energy collector attached, tripled the electrical performance of the others and could be produced”, says Del Amo, technical director of EndeF. The three partners of the company came to the event with several prototypes and realized that they had a product with which they “could produce electricity and heat on the same panel, occupying 40% less space and providing excellent energy yield, which reduced the payback period to six or seven years”. Ecomesh hybrid panels had just been invented. The next step was to assemble a production line and an installation business to install the panels in three buildings in Zaragoza. By monitoring these three pilot facilities since last year, they have confirmed the validity of the data collected in the laboratory. As they provide the entire production process, from the engineering phase to installation, including the manufacture of the panels, there has been another positive effect: the generation of new jobs. “The goal we set in 2013 for 2014 was that one of us would be able to earn a living with the company and we have ended the year with ten employees with an average age of 32”, says the technical director of EndeF. Such progress would not have been possible, at least not so quickly, if they had not decided to enter several competitions seeking prizes and, therefore, funding. “We knew we had an industrial product but we needed a lot of money to finance it”. One of the first options they considered was the Repsol Foundation’s Entrepreneurs Fund, which supports innovative projects that promote energy efficiency. Their panel was one of the eight winning ideas among 470 candidates in the 2013 edition. The prize consisted in two years in a business incubator with guidance offered by three tutors who would assist them through the maze of business processes – “people with experience who help you to develop your ideas and who provide useful advice to consolidate the business and develop” – and 12,000 euros, half for recurring costs (wages, travel and other day-to-day expenses) and the rest dedicated to technical issues, such as manufacturing prototypes, buying material… “Repsol’s competition is by far the best regarding conditions because even if you do not attract an investor, the company is still yours, you don’t owe anyone anything and you have a product on the market”, explains Alejandro del Amo. This support resulted in them leaving the university and embarking on a full-time business venture. This year, which has just begun, they hope to expand the business to the rest of Spain – they are presenting their hybrid panels to installation and building companies, architects and engineers – without ignoring the possibility of international deals. “It is very attractive but costly. Our goal is to try to sell in other countries, especially considering the situation in Spain. Looking back, Del Amo advises other entrepreneurs who have an idea and are starting to develop it to seek a market niche, compare it with what already exists in order to improve it and to market it as soon as possible “because, if not, someone else is going to come out with something else and beat you to it”. He recommends entering all types of competitions to obtain funding and incubators that provide business training. “If you get the money, that’s one step, and they will help you a lot”. In addition, each time you win a prize or get selected you achieve recognition, you get lots of e-mails from people who are interested”, he summarises. What about resorting to the Government? The technical director of EndeF regrets that there is “so much bla bla bla about entrepreneurship but little real aid. There are lots of ideas that are worthwhile but not all can be promoted by Repsol and other similar institutions”.